Goodreads Summary: Set several years after the events of the first, this trilogy will star an older Ethan Chase, Meghan's brother. Why am I waiting on The Lost Prince? 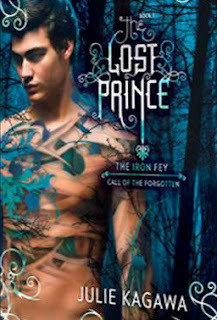 I adore Julie Kagawa’s books and the Iron Fey series is one of my all time favorites! I am giddy about the fact that Ms. Kagawa is doing a spin-off series featuring Megan’s little brother Ethan! While the cover is a little more adult paranormal romance that I expected, it does not matter. The cover of this book could be blank and I would still be anxiously waiting for it. I don’t even need a full summary to know it will be awesome. I really like how certain elements like the font and the swirls tie in to the rest of the series. What books are you waiting on? I saw this cover on your blog and I did a double take! haha! Although I wasn't AS excited as you about this series, I think a spin off sounds awesome. Just different enough to be new, but familiar enough to be comfortable. I was very surprised to find out that the boy on the cover is Ethan! Well because I've only read the first book in the series. I really need to catch up! Here's my WoW! Chosen at Nightfall is HERE!!! Thailand: Number One Customer and "Spiritual Adultery"
Welcome to my blog! I am a Christian, a wife and a mom. My name is NC and I am an avid reader. I love books and read mostly young adult (YA) fiction. My favorite genres are paranormal romance and dystopia. So Many Awesome New Releases, So Little Time! Kindle Fire + $50 Amazon Gift Card Giveaway! Hoppy Easter Eggstravag​anza Giveaway Hop! In accordance with FTC guidlines concerning blogging endorsements, books reviewed on Truly Bookish have been borrowed, purchased, received on tour, or received from the publisher with no form of monetary compensation unless otherwise specified. Graphics by www.intothemorningreads.blogspot.com. Powered by Blogger.